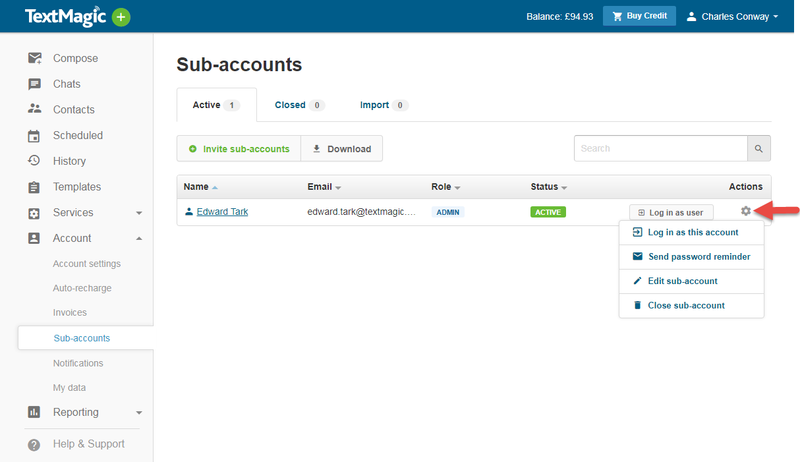 Administrator – gives access to all TextMagic features, including payments and sub-account management. Regular user – gives access to all TextMagic features, except payments and sub-account management. You can also manage sub-accounts’ persmissions as necessary. Sub-accounts will always use the SMS credit of the parent account. 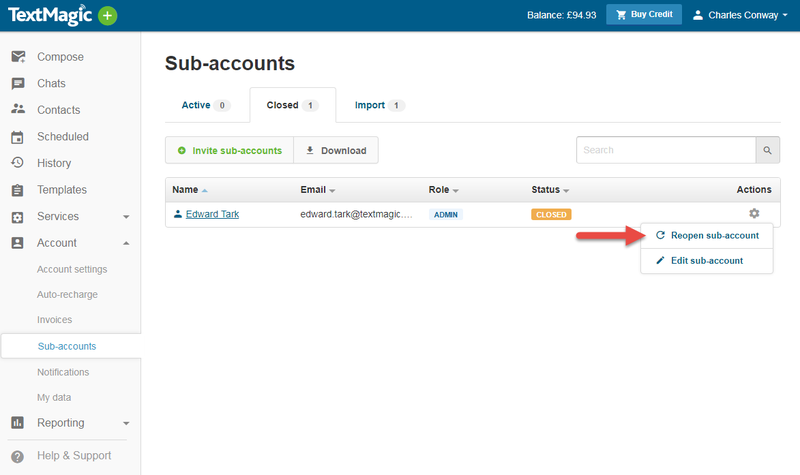 You can monitor the credit usage from the Sub-accounts reporting or Statements page. A dedicated virtual number cannot be shared between sub-accounts. 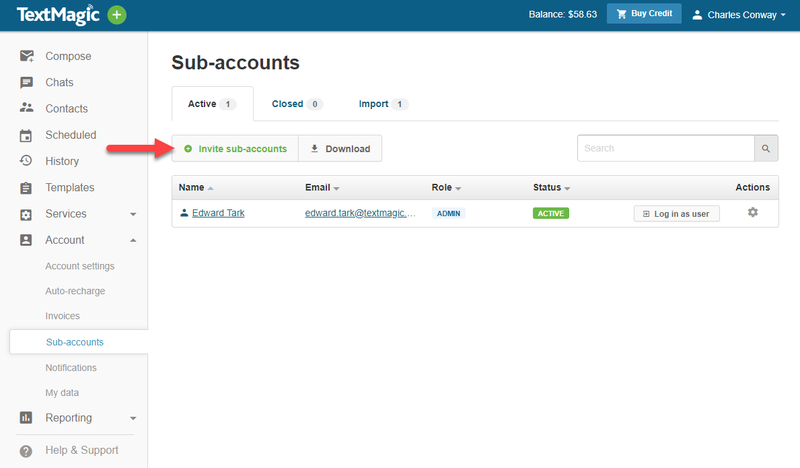 Select Account and then Sub-accounts from the main menu. Choose to Invite a new sub-account. An invitation to join, along with the account details and further steps, will be sent to your team member. Once the invitation is accepted, your team member can use the TextMagic account. 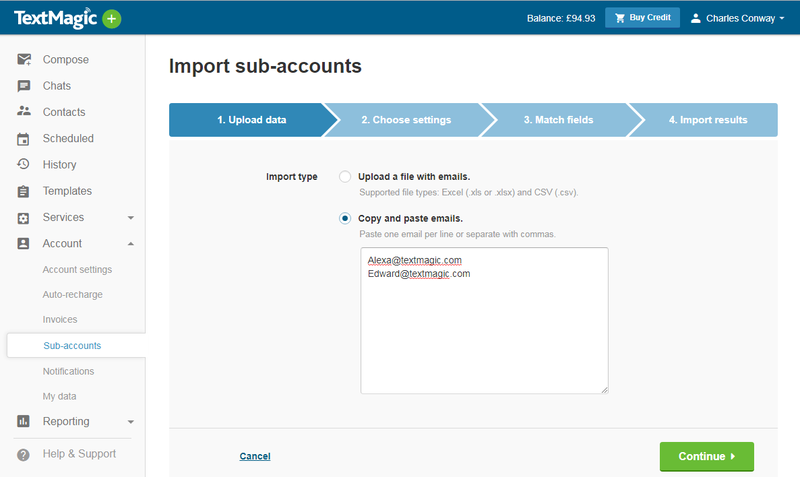 Upload a file with emails, or copy and paste emails. Select the default role and click Continue. An invitation to join, along with account details and instructions will be sent to your team members. Click the Actions icon next to the sub-account. Click Log in as this account. If you have an Administrator role, you can also Send a password reminder, Edit a sub-account or Close a sub-account. Please note: If you close a sub-account, the dedicated number subscription that, which is associated with this account will be cancelled and cannot be restored. Confirm that you wish to reopen this sub-account.